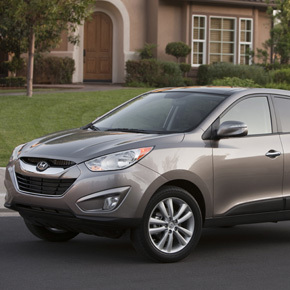 LOS ANGELES, Dec. 3, 2009 ?In 2010, a revolutionary new Tucson joins the rapidly evolving Hyundai product line. The sleek crossover from Hyundai, with its athletic European design, strikes a stark contrast from its predecessor and improves in every functional area, from its roomier cabin with extra cargo space to its leap in fuel economy and technology. 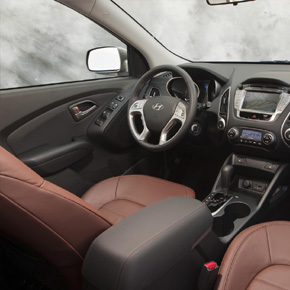 Tucson features the company’s “Fluidic Sculpture” design language and is the first vehicle in Hyundai’s 24/7 version 2.0 product initiative (seven all-new models by the end of 2011). The all-new Tucson is the first Hyundai CUV (Crossover Utility Vehicle) to be designed and engineered in Europe at Hyundai’s Frankfurt-based design and technical centers. 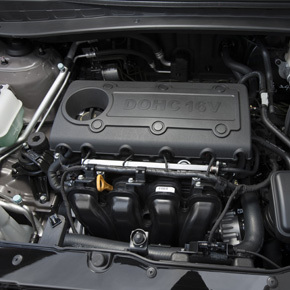 It features precedent-setting engineering including advanced weight saving technology and the eco-efficient Theta II 2.4-liter four-cylinder engine delivering up to 31 mpg on the highway. True to Hyundai form, the Tucson applies life-saving safety technologies as standard equipment while offering, for the first time, Downhill Brake Control (DBC) and Hillstart Assist Control (HAC). 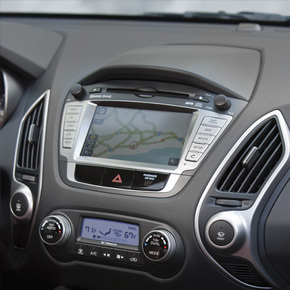 Likewise, to keep its passengers informed and comfortable Tucson integrates Hyundai’s first panoramic sunroof, touch-screen navigation and a Bluetooth?/sup> hands-free phone system. Conceived in a global collaboration among Hyundai’s U.S., Korean and European advanced product groups, with design execution led by the Frankfurt studio, the new Tucson was developed as an urban cruiser. It is tough and compact for life in the city, yet sleek and agile for out-of-town travel. The Tucson combines dynamic, sculpted, performance-oriented styling with thoughtful everyday utility to create a vehicle that will change the way consumers, especially younger car buyers, think about compact crossovers. The profile of Tucson features a sports car-like theme with a double-zigzag treatment for the wheel arches that wrap around the available Euroflange 18-inch alloy wheels. The concave sills have a wedge-shaped profile that extends rearward and wraps around into the rear bumper, a first of its kind design in a vehicle of this type. The profile is further enhanced by modern silver roof rails.